I teach and play classical and electric guitar; teach classical guitar up to and beyond grade 8 standard. Check my guitar page for current rates for lessons, etc.</a>. Can prepare for Associated Board Guitar and Theory Grade exams. Can coach for performance, exams, etc on classical, rock and Latin American guitar styles. Inevitably, I'm on Facebook. . Also on Google Plus, here., on Instagram, on Flicker. 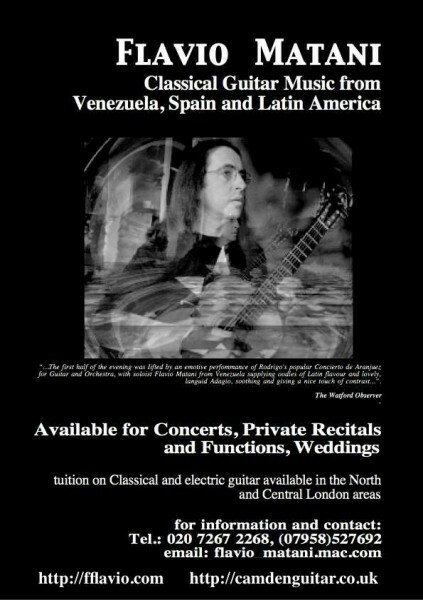 Venezuelan, Italian, classical guitarist, landed in London 20+ years ago and never left. can also be reached at this gmail address. Also have worked translating and interpreting Spanish-English (which I found enormous fun! maybe there's something wrong with me!) and teaching the Spanish language. But mostly, these days, in Facebook. another page on Soundcloud with classical guitar samples. .. Even though I do not agree with their coverage of news from Venezuela or Palestine, in which they so often, in unquestioning and sycophantic manner, toe the Empire's line. "Home is where you hang your hat... and I've got a lot of hats." kaerasta, the best flatmate in the world. Probably.